St. Vital Centre, a 928,000 sq ft regional shopping centre, is recognized as one of Manitoba’s greenest buildings and ultimately the greenest retail centre within the province. While the centre’s eco-friendly initiatives are nothing new, the centre’s major renovation in 2012 was the perfect opportunity to further reduce the property’s overall carbon footprint earning St. Vital Centre national industry recognition as a leader in social and sustainable responsibility. Low flow faucets in washrooms, hand dryers, hands free soap dispensers, toilets and urinals which have reduced the annual water bill by $12,000. 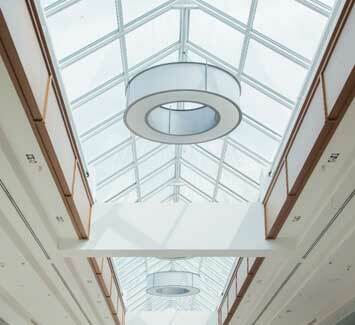 LED energy efficient lighting controlled by a building automation system which allows for daylight harvesting. Partnership with Habitat for Humanity and the City of Winnipeg, allowing for 20,456 pounds of material to be re-sold at the Habitat Re-Store. New condensing boilers reducing gas consumption by 50%. Waste and recycling computer system that monitors bin weights to reduce our carbon footprint.